This restaurant in Newport, Vermont is just off the boardwalk with beautiful views of Lake Memphremagog. Outdoor seating and expansive windows take advantage of its lakeside location, and with a variety of seating options (bar, lounge seating, and the dining room) you can enjoy the view from your preferred dining style. Walking into Le Belvedere, the first thing you notice is the decor. The space is very modern with an industrial flare (though this is increasing in popularity in the area – Le Belvedere is the first NEK restaurant, at least that I saw, to embrace the design style). A metal bar and exposed duct work are offset by large black leather chairs in the lounge area, linen covered tables throughout, and the expansive view. Now, this is a favorite stop when we do adult dinner (that post is coming soon), and we often grab drinks and apps here. 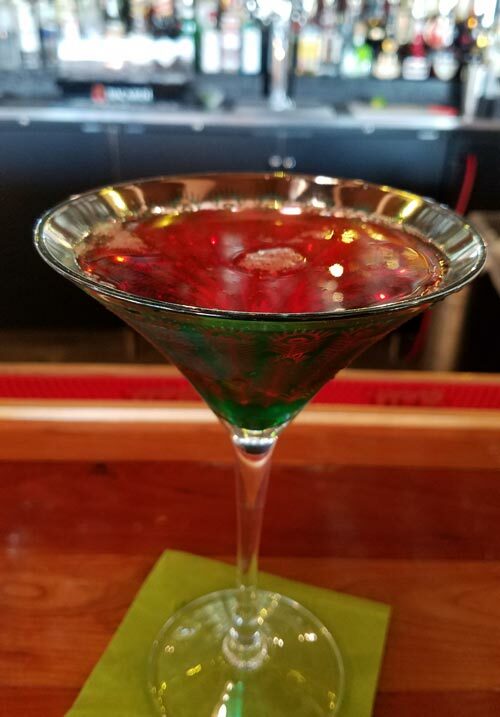 The cocktails are reasonable priced, on par with the nearby bars and restaurants, but there are a number of options available on their list that you won’t find many other places – such as the lychee liqueur. As for the appetizers – their calamari is fantastic. Fried with banana peppers and capers, it is always perfectly cooked and is served with an aioli sauce instead of marinara, giving it a nice zing. Recently, we experienced their entrées for the first time – and we weren’t disappointed. We chose to sit at the bar. The bartender took our order within minutes. This excellent service carried out through the remainder of our visit.From what I could tell, other tables throughout the lounge and dining room experienced the same. I ordered the lychee cocktail – I highly recommend trying this. It is fruity but has a different flavor profile than fruit liquors more common to the area. My husband ordered his standard martini (he must compare them all). With our drinks, we tried an app on special. The mussels and clams on special were tossed in a light tomato and wine sauce, served with crostinis. 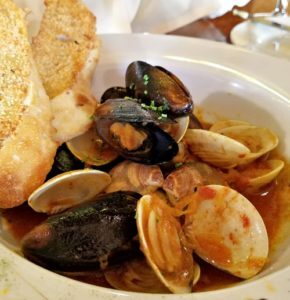 Again, this was a pairing different from many area restaurants that go with a white wine, garlic butter sauce that is more like Italian cuisine. 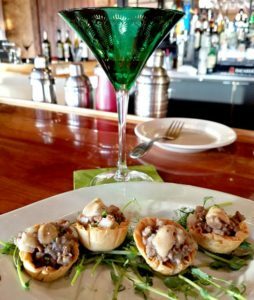 I couldn’t decide on dinner, so I ordered two apps from the regular menu – Escargot Provencal and venison tourtiere. 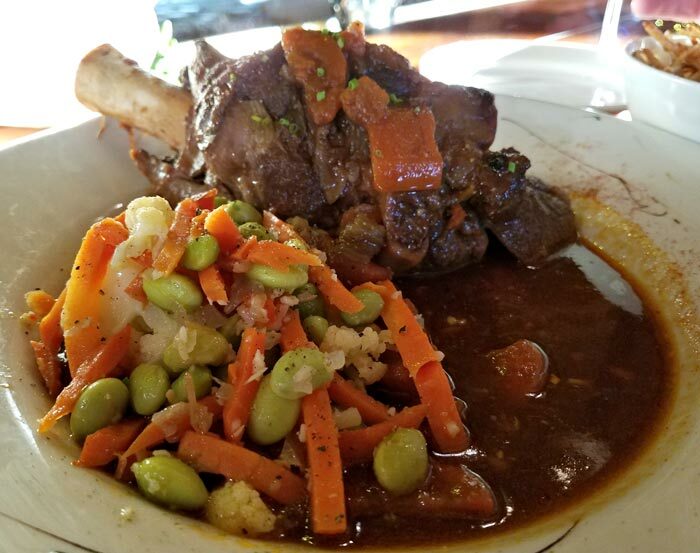 My husband ordered the lamb shank. The highlight of the meal was the tourtiere. First, if you are not familiar, tourtiere is meat pie – and it is a traditional favorite of French Canadian descent throughout the region. This dish comes with four small ‘cups’ stuffed with a venison/potato mixture, served open. The pastry was light and crumbly. It provided the perfect vessel for the filling. Full of flavor and well balanced, this filling held together while you were eating. The light flavor of the venison was not overpowered by pepper, nor was it bland. The only problem with this dish is that there were not enough of them. I am an escargot fan. I will say that I have only had it as an app served in a wine and garlic butter sauce – but even that variation is missing from menus in the Kingdom. Seeing this on the menu at Le Belvedere I knew I had to give it a try. This dish was more than I had anticipated; served with asparagus, capers, tomato spinach, olives and onions it was hearty enough for a meal. 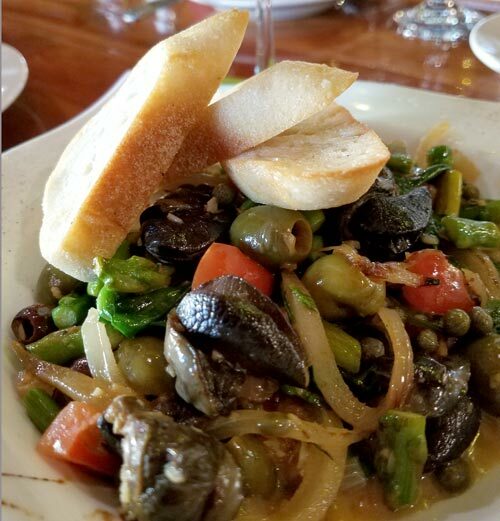 I liked the saltiness of the capers and olives with the seafood, and the escargot were nicely cooked – not at all rubbery. The amount of vegetables did overpower the seafood though. If you are looking for a dish where escargot is the star – this isn’t it. But, if you are looking for a wonderful flavor combination, especially on some toasted bread – this would be a nice choice. My husband’s entrée was beautifully presented, but was a lot more food than anticipated (check out the photo at the top of the page). The lamb was braised in Chianti and flaked off the bone with a fork. Full of flavor, and soft on the palate – it was a very enjoyable dish. But, lamb is filling and very rich so this dish is not for the small of appetite. Served with a medley of vegetables this hearty meal will fill you up, and may still end up in a doggy bag for tomorrow’s lunch. Unfortunately, we didn’t get to try dessert, frankly there was no room. But it gives us a good reason to go back! Le Belvedere is right next to where Music on the Waterfront takes place on Wednesday’s through the summer season – so swing into this Newport restaurant and give them a try before enjoying the show.